In light of the chronically deep disparities in health and wellness in Central Brooklyn compared with other New York regions, Governor Andrew Cuomo's Vital Brooklyn Initiative aims to bring a new holistic model of community development to these areas, together addressing jobs, health, housing, crime, poverty and lack of open space. 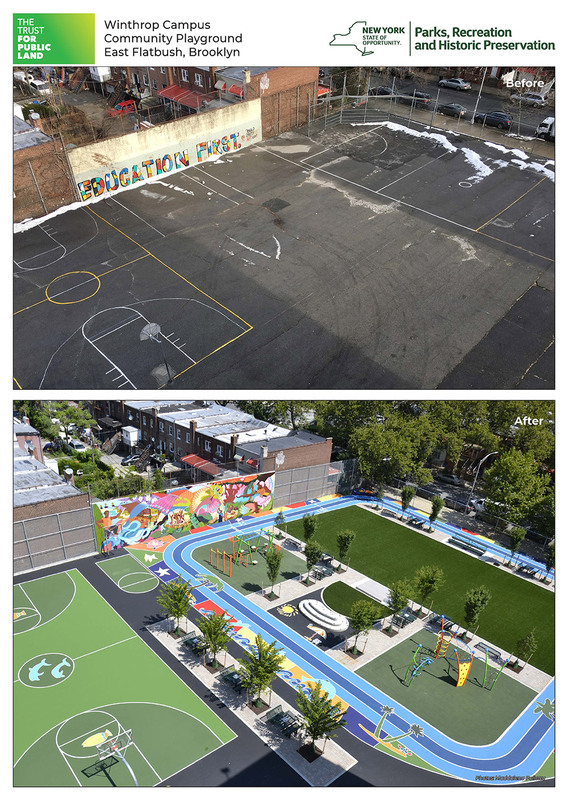 New York State found a natural partner in the Trust for Public Land: Since 1996, our New York City Playgrounds Program has transformed over 160 acres of barren asphalt school lots into nearly 200 vibrant school/community playgrounds – directly impacting improved health and wellness in the City. To fulfill Vital Brooklyn's open space goals of bringing parks to the neighborhoods most in need, New York State granted us $10.6 million to transform eight schoolyards in some of Brooklyn's most underserved neighborhoods: Brownsville, Bushwick, East Flatbush, Canarsie, Crown Heights, and East New York. The Trust for Public Land joined these State funds with other funding, including green infrastructure monies from the New York City Department of Environmental Protection and private philanthropy from such partners as New York Road Runners, continuing to apply our proven public-private partnership model with the City. The Central Brooklyn neighborhoods are among the park-poorest in the city. In East Flatbush, where we opened our first Vital Brooklyn playground in September 2018, only 1% of the land is parkland, compared with nearly 20% citywide. In fact, there are no parks within a 1/4 mile radius of the site. This lack of parkland is a contributing factor to poor public health: Indeed, among New York State's 62 counties, Kings (Brooklyn) ranks near the bottom in health at 52. Every one of the targeted neighborhoods has higher obesity and diabetes rates than the city average. We're aiming to change that by bringing accessible parks and green spaces to people where they live. Beginning in the fall of 2017, we engaged Brooklyn students and community members in our signature participatory design program that allows the school community to create the park of their dreams. Design has been completed at the first five sites, and in September 2018, we celebrated the grand opening of the first Vital Brooklyn site at IS 581, The Winthrop Campus, in East Flatbush. Here, the student-designed yard included an artificial turf field, three-lane running track, basketball courts, an outdoor classroom/performance space, game tables, benches, shade trees, and a Caribbean-themed mural. All eight playgrounds will be open to schools and communities by 2020. As well as serving recreational needs, our playgrounds will also help the city adapt to increased precipitation and heat from climate change. Just one of our playgrounds captures an average 1 million gallons of storm water every year and multiple trees mitigate the heat-island effect and provide cool shade. The new parks are transformative not just to the immediate well-being of Brooklynites, but to the future impacts of climate change as well. We know that high quality parks make communities happier, healthier, safer, cleaner, greener, and more resilient. After our work is done, the 130,000 people living within a 10-minute walk of the eight Vital Brooklyn sites will be at reduced risk for obesity, diabetes, depression and more. Students at the eight schools will have new places to run, play, and learn outside. And because The Trust for Public Land's involvement means that playgrounds are open after school hours and on weekends, the whole neighborhood will benefit. Creating parks and protecting land for people doesn't happen without people. You can help us make a difference. Help support playgrounds by donating today. Watch this video to learn more about our NYC Playgrounds program.